The strong El Nino in the Pacific Ocean now covers nearly two-thirds of the equatorial Pacific between Asia and the Americas. However, in its eastern section, the co-called Nino 1&2, it has subsided somewhat over the past month. The deviation from normal is still strong, around 2oC, but it is considerably less than the peak deviation of 3.5oC in early August. The flipside is that the warmer waters close to the Equadorian coast are now transported by the sea currents towards the west, meaning El Nino conditions in the central Pacific, the Nino 3 zone, will become worse before improving. Closer to Indonesia in the Nino 4 zone, sea surface temperatures are much closer to normal, now only exceeding the usual reading by between 1oC and 1.5oC. On local shores another strong high pressure cell sat just south of the continent on Monday. This high very slowly shifted towards the east as the week progressed but it was in no hurry to depart Africa. It created a strong airflow from the south that covered most of southern Africa, bringing in unseasonally cold nights. This was evidenced by the very low temperatures in the Karas region on both Monday and Tuesday morning. It was accompanied by a fresh wind so the south felt as it had a relapse to winter for two days. 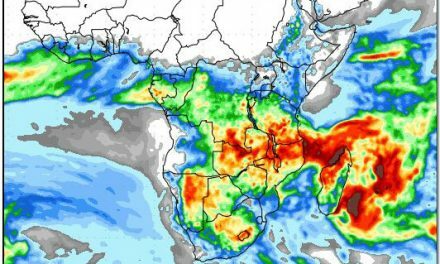 As the high shifted east, it crept up the eastern coast of Africa with a northward extension that impacted local weather as far north as Tanzania. The high remained in situ for two days before it moved to a position just south of Madagascar. It is expected to stay in this vicinity during the weekend and into next week, only shifting marginally to the east. 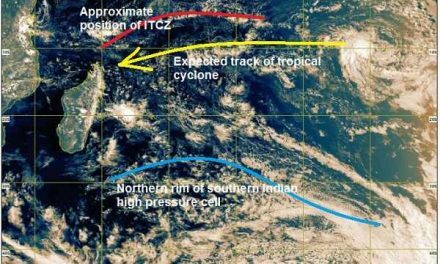 As the high moved up the eastern coastline, the anti-cyclonic circulation over the sub-continent started drawing lighter, warmer air down the west coast. As always, this system enters Namibian airspace from Angola in the north-western corner coming across the Kunene. Thus, over the eastern half of southern Africa, the airflow is from south to north, while over the western half, it is the opposite, from north to south. The high’s impact is strongest close to the surface up to about 15,000 feet. In the mid levels between 15,000 and 30,000 feet a lower pressure system that originates in central Africa is in control. 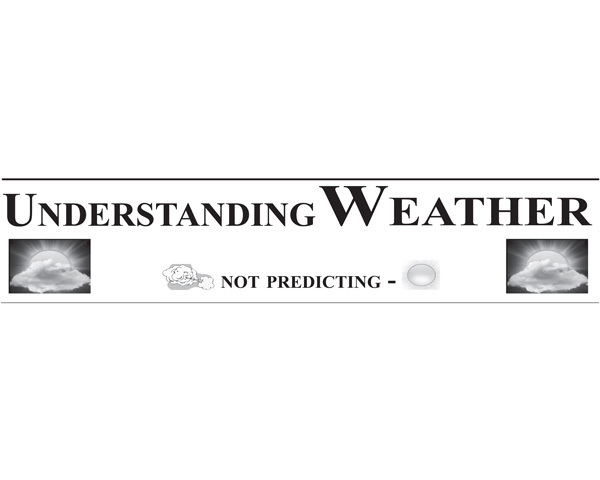 This leads to the observed contradiction that the wind is from the south or south-east on the surface while the clouds move visibly from the north-west to the south-east. This mid level low pressure control formed the very familiar trough that runs from Angola through Namibia into the South African interior. It brought cloudiness over the Namibian interior on Wednesday, Thursday and Friday. It was also noticeable that while the cloudbase was still at 18,000 feet on Monday, it has come down to around 10,000 feet by Thursday. It is an indication of moisture penetrating from the north while at the same time, the surface high moving away to the east. The overall effect was that this week was much cooler than the previous and this applied up to Otjiwarongo. But even the northern and north-eastern areas, while still hot, only heated up during the day to around 35oC. Despite the pervasive cloudiness, convection remained inhibited with the cloud tops hardly exceeding 35,000 feet. The result was very limited precipitation, scattered and isolated. The synoptic feature to watch is the contour of the 1016 mB isobar especially as it curves and warps over land. The weekend starts with local weather split into two. The northern half is controlled by low pressure conditions, which gradually spread across the interior of the sub-continent. This encompasses the northern half of Namibia, the northern half of Botswana, the Limpopo Province in South Africa, Zimbabwe, western Zambia and the south eastern quadrant of Angola. This is more or less also the extend of the greater Kalahari basin which indicates that the flatness of the land and solar irradiation contribute to cause hot to very hot conditions. The next approaching South Atlantic high is still far offshore, its core more than 2000 km away. This leaves space for lighter air to be advected from Angola, but the moisture is limited. However, with the core of the anti-cyclonic circulation over central Botswana, airflow on the western rim remains from north to south. Cloud will form over the interior from the Kunene up to the Orange almost daily. Temperatures will go back to very hot.